During the Kunstweekend Charlois, Het Wilde Weten and Tent. 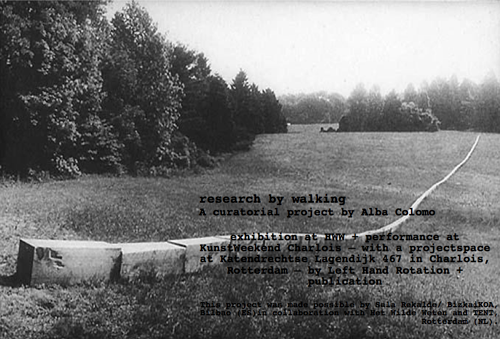 Rotterdam present the project Research by walking by Alba Colomo, current guest curator and artist in residence resident at Het Wilde Weten. The high concentration of artists -and the so called ‘creative professionals’- working living in some parts of Rotterdam seems to be one of the political strategies implemented by the local authorities to regenerate the socio-economic milieu. Research by walking focuses on the role of artists in re-shaping the social landscape in the South of the city and how this relates this to the urban development policies delineated by the city council over the past years. During the Kunstweekend Charlois the artist collective Left Hand Rotation will do an intervention in the public space, looking at the risk of potential gentrification in the area. Research by walking is part of the Artweekend / Kunstweekend Charlois This could be Rotterdam or Anywhere…, opened by Mariette Dölle, director of Tent., at the Nieuwe Oogst on Thursday 21 June at 17.00 h.